A large oxidized tin lantern which can be used either as a hanging lantern or as a candle lamp. 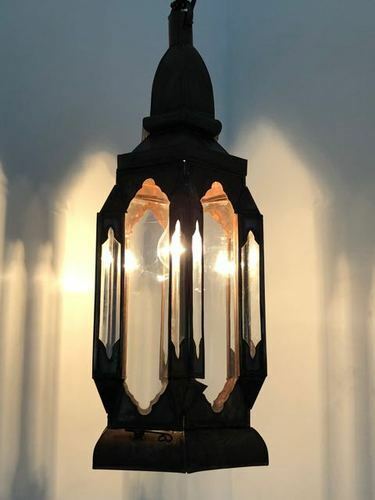 A very traditional style lantern handcrafted in the souks of Marrakech by skilled artisans. To meet the growing requirements of Industrial Vintage Furniture, Kraft Tree was established in 2015 as manufacturer, exporter, and wholesaler. We are renowned for our wide range of products which include Reclaimed furniture, Wooden Bedsides, and Wooden Chairs. The company creatively uses color, shape, size, material and functionality to design unique products that will delight the customers. In addition to this, the range offered by us is designed and manufactured in compliance with latest market trends at industry leading prices. Moreover, our ability to fulfill emergent of bulk orders within the specified time has enabled us to serve huge clientele. Having developed a well-equipped manufacturing unit and an in-house design unit, we have been able to meet the specific requirements of our valued clients. Our sound infrastructure, flawless range, customization capabilities and timely delivery of consignment have earned us a huge clientele across the country. Our team comprises experienced professionals who use premium quality raw materials to fabricate a complete compliance matching up with the international quality standards. We possess an excellent example of providing highly efficient and quality products at affordable prices as per clients required quantities within the desired time frame.